Have party décor envy? 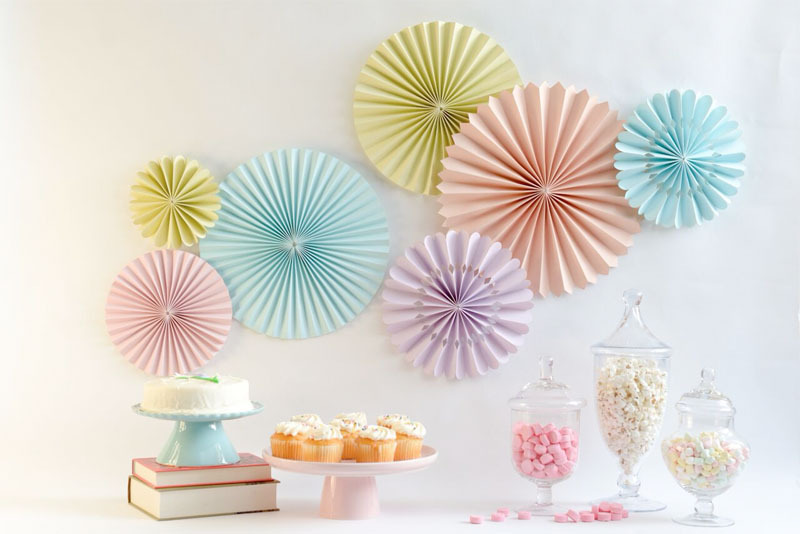 Leave that envy behind and rock your next set of decorations using the various rosette patterns. Whether you are making a set to put behind the dessert table or creating a photo wall, you are covered! Just put them up, stand back, and admire! Using the templates cut out desired shapes in a variety of colors. Score and fan-fold each piece on the dotted lines (guide is found on the template pieces). Adhere coordinating sections together to make a long strip. Beginning with the first fan, adhere the first section to the last section making a cylinder. With it standing on end, gently press it flat so the decorative edge is on the outside and the flat edge is in the center. Press the loop flat so the decorative edge is on the outside and the flat edge is in the center. Hot glue in the center. Hold in place until glue cools. Repeat with the remaining fan sets. Each rosette takes approximately 4 pieces. More may be added for additional fullness (add them in before step 4). Use the circles to hold the hot glue in place during step 4 instead of afterwards, adding a circle to the back as well. Create a display full of various sized medallions by scaling down or enlarging the template sizes.